Horticulturist Brett Heap says his business can survive under current immigration laws, but bureaucracy is holding him back. 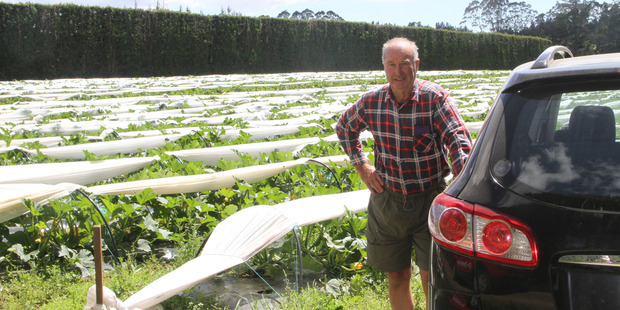 Anyone who buys zucchini at their supermarket can probably thank Kerikeri horticulturist Brett Heap for growing them. Ten hectares of his property is producing the would-be marrows, and he would be planting more if government bureaucracy wasn't holding him back. Put simply, Mr Heap legitimately employs nine Thai nationals, under the Recognised Seasonal Employer (RSE) scheme, which permits the employment of foreign nationals to fill jobs that New Zealanders cannot or will not do. He would like to employ two more, but has been told by Immigration NZ that he can't have them. The number of Thai workers was capped - for reasons he did not understand - and if he wanted to add to his payroll he would have to take Pacific Islanders. Mr Heap did not want to do that for reasons including a potential clash of cultures, which he had witnessed courtesy of a neighbour. And he had given up all hope of employing locals. The stalemate, he said, could be broken if the RSE was administered by the Ministry of Primary Industries rather than MBIE and WINZ, but while he had no plans to give up, his record in terms of persuading politicians and bureaucrats to listen was not encouraging. He had dealt with 15 MPs and ministers over the last 15-odd years, he said, the only one who had done all he could being then Northland candidate for the National Party, Matt King, who Mr Heap had no doubt was "ministerial material". He had been on the verge of quitting 15 years ago, when illegal labour was all that was holding the sector together in the Bay of Islands, Hawke's Bay and the Bay of Plenty, a fact that was met by Immigration with raids and the deportation of said illegal workers. The local industry was "not that keen" to stand up to that, he said, most growers preferring to keep their heads down in the hopes of "getting by". Never one to shy away from being an "extraordinary nuisance", Mr Heap set about changing the system. Now the RSE scheme had transformed the labour environment, particularly in a labour-intensive field such as his, but it had its limitations, which he saw as arbitrary and counter-productive. "Picking is the problem," he said. And the Thais who were working for him did a very good job. They picked every day over the season, July to December, peaking at five tonnes and more per days. The money wasn't bad either. Two boys, aged 13 and 15, who had worked for him over the recent school holidays had each taken home $891 home in the hand. He was happy to employ New Zealanders, but had not had the best of experiences. Earlier this year he had employed a WINZ referral, who he described as a good worker but having serious issues and needing support. "I was prepared to invest in him, but he needed help from a number of government agencies, and he didn't get it," he said. "I've been hung out to dry by those agencies, that clearly have no interest in doing their jobs." That employee lasted six or eight months before giving up hope and leaving, taking the company vehicle he had been given the use of with him - which was now generating traffic infringement notices that were finding their way to Mr Heap's address. "I need people I can rely on, and the Thais who come here are both skilled and reliable. The only barrier is the cap that's been put in the number who can come here. Not the number of foreign nationals but the number of Thais." The RSE scheme, Mr Heap said, was mismanaged, misapplied and under-achieving for those who, like him, had established relationships in terms of recruiting beyond the Pacific Islands. He had a legal opinion to support that. The scheme needed a complete review, which had been supposed to happen before the end of the year. It was not clear what would happen now with the new government's attitude towards immigration. "I'm a patriot. I'm fighting for what's best for New Zealand, but the government doesn't want to know about it," he added. "The irony is that if I could have two more Thais I could expand, and I could provide work for a New Zealander, through WINZ. This cap is costing a New Zealander a job. I don't get it." The MBIE had told him that even if allowing the two extra Thai workers would create jobs for 20 New Zealanders the answer would still be no. "I just don't get it," he said.